This is my first ring made in this style of jewelry design and I'm so happy with the results. In fact, I'm so happy with how it turned out that I almost kept it for myself! I love sea-side colors and that's exactly what the combination of greens, blues and mauve joined with cream and white make me think of. 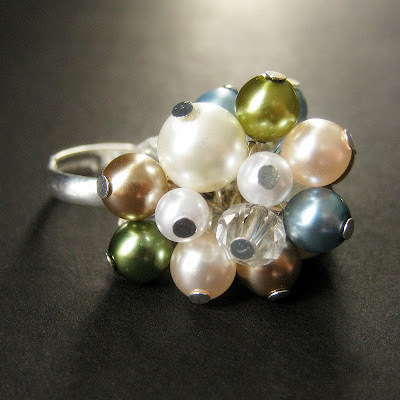 Elegant and soft, this pearl ring's design is a blend of white and seaside colored glass pearls with a touch of shimmering crystal glass accents all bunched together on a silver toned adjustable ring base. The ring is a unique OOAK (One of a Kind) piece and I know I'll be making more in different styles and colors in the future and that they will be OOAK as well. This beautiful vintage inspired pearl cocktail ring is perfect for any occasion. It has adjustable sizing from a size 6 and up, making it comfortable for the wearer no matter the size as well as ideal for switching from finger to finger depending on mood or preference.